The Ravens’ Roost Cohousing (RRC) is an award-winning project and the first of its kind for Alaska. It’s unique in that the future residents are the developers. The RRC owners are people from many diverse walks of life, previously unknown to one another, who came together to form a development Limited Liability Company for the purpose of building a new type of neighborhood in Anchorage. 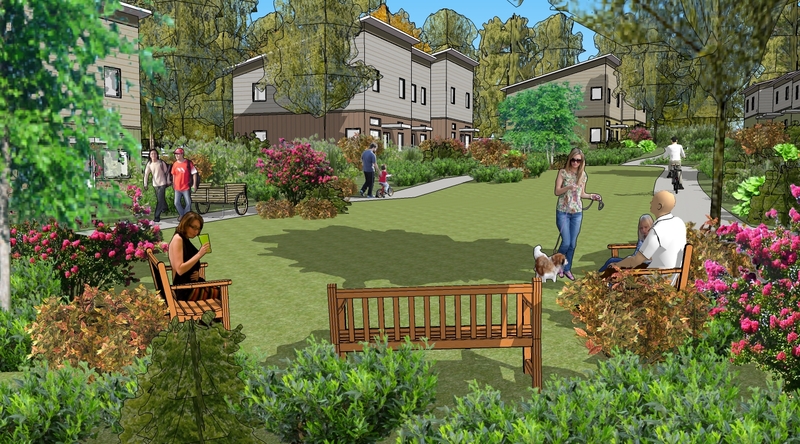 Cohousing is a type of collaborative housing in which residents actively participate in the design and operation of their own neighborhood. These residents are consciously committed to living as a community. The physical design of the housing encourages both social contact and individual space. Private homes contain all the features of conventional homes, but residents also have access to extensive common facilities such as courtyards, a playground, gardens, and a common house. For a typical project the design engineer works for the architect. However, for this project EEI’s team worked directly for the client and collaborated on engineering decisions, creative solutions, and in educating the Municipality of Anchorage personnel and the Abbott Loop Community Council on the elements, advantages, and impact of cohousing in Anchorage. EEI used innovative applications of existing techniques as well as creative problem solving to meet the physical and philosophical needs of the cohousing residents. This applied to site grading and drainage, layout of communal space design, and materials selection.